The Fatima Children’s House was opened in March 2012. The First Graduation Ceremony for Kiryel Im and Sungwon Shin was held on Tuesday, February 17th at the Hospital Chapel. They marched in holding lighted candle and in the touching and happy mood the First Graduation Ceremony was started with the Liturgy of Word by the Chaplain of the Pastoral Care Service, Reverend Father Haewon Im. After the Liturgy of Word, the principal of the Children’s House Sr. Candida Kim presented each with the graduation and honor certificates. 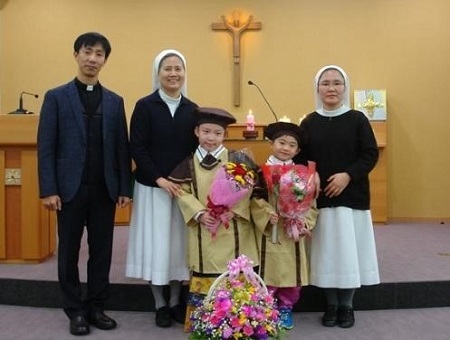 The program was followed with Graduation Song by the children; and parents, relatives, teachers, and sisters gave big and warm applause in praying and blessing for their new start.